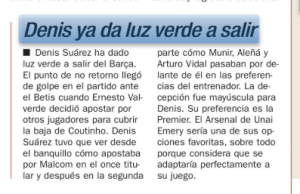 Spanish newspaper AS report on Sunday that Denis Suarez has had enough. The 24 year old has realised how far down the pecking order he is at Barcelona and wants a move away from the club. AS say he’s now given the ‘green light’ to a transfer. The ‘point of no return’ came in the recent match against Real Betis, when Ernesto Valverde used several other options before Suarez, and he didn’t get any minutes despite injuries to other players. It’s explained ‘the disappointment was huge’ and Suarez, when thinking about a transfer, has decided a move to the Premier League would be his preferred option. Arsenal would be a ‘favourite option’ for the attacking midfielder, with AS pointing out that Unai Emery’s style would suit the Barcelona player. He could ‘adapt perfectly’ to the football. What AS don’t say is whether Arsenal are doing anything about this. It’s not made clear whether there’s even any strong interest from the Gunners, or if this is all the planning of the Spanish newspaper themselves.